Tony Cordova is the honor guard captain of the Veterans of Foreign Wars Post 8788 in McAllen, which gives military honors to about 130 funerals a year. Cordova served in the U.S. Marine Corps as a helicopter gunner during the Vietnam War, and has spent the past 30 years honoring servicemen who have died at the VFW and those injured with the local chapter of the Military Order of the Purple Heart. 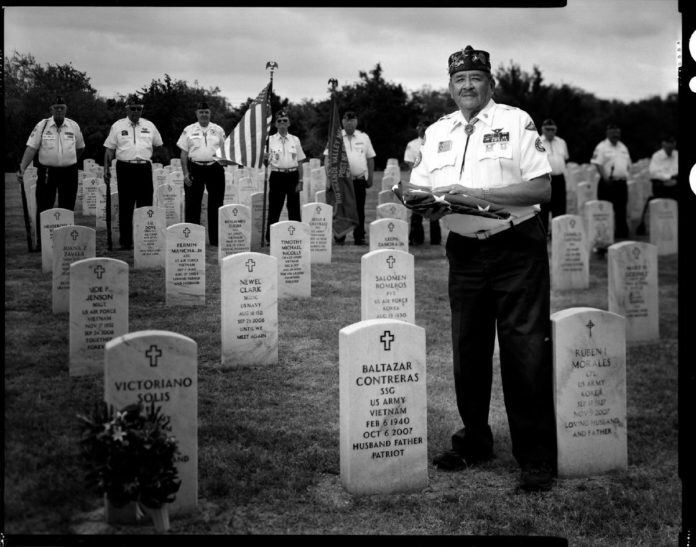 Cordova is photographed at the Rio Grande Valley State Veterans Cemetery in Mission. Tony Cordova and nearly a dozen honor guard members found themselves at the Rio Grande Valley State Veterans Cemetery on a Friday morning in early May, a local funeral home having contacted them days prior to perform military honors for a 28-year-old Army specialist who died from service-connected cancer. This was the group’s 50th funeral since the start of the year, putting them on track to possibly exceed the 133 they conducted last year. Veterans of Foreign Wars Post 8788 is the most in-demand honor guard in the Rio Grande Valley, Cordova will tell you, simply because of its position at the top of the list of VFW posts given to local funeral homes. But the reason is more likely a product of the men and women of the McAllen post always showing up when called, cobbling together an honor guard out of whoever is available. Decades older than the soldier they honored that day, the guardsmen’s advanced age was visible in the details. The player who performed taps did not stand but sat proudly on his walker; the precision and coordination of the 21-gun salute fading from slowing reflexes. Their all-volunteer guard isn’t getting any younger, and very few new members are joining to take over the duties performed by the Vietnam veterans who carefully fold and present the American flag to the deceased’s family, play taps and conduct the 21-gun salute. Cordova, 80, is the honor guard’s captain and chaplain, leading it through the time-honored ceremony, one he has performed countless times for service members young and old since he joined VFW Post 8788 in the 1990s — some included fellow Vietnam veterans, others were casualties of Iraq and Afghanistan, wars that have defined a new generation. He has dedicated nearly three decades of his life to honoring the lives and deaths of servicemen and women he never knew, with whom he is connected by the shared and — at times — isolating experience of having served the country. When it comes time to bury him and his fellow guardsmen, who will perform their last rites, Cordova ponders each time he offers a prayer before someone is laid to rest. “Somebody needs to pick up the torch and carry it forward,” he said. Cordova sees his participation in the VFW, as well as the local Military Order of the Purple Heart, of which he is the commander, as an extension of his military service. “They needed help and I thought I could be of assistance,” he said of the plain and simple reason he joined the service-oriented foundation, which assists injured and indigent veterans. He was sent to Vietnam, serving 257 combat missions as a helicopter gunner from April 1966 to May 1967. His helicopter was shot down three times, or “forced to land” as he prefers to describe it, and he was awarded a Purple Heart. Modest and soft-spoken with a sharp sense of humor, the decorated Marine and retired Texas Department of Public Safety undercover narcotics agent doesn’t focus on his own achievements, but rather on those of the men and women he surrounds himself with at the post’s headquarters on Pecan Boulevard and North Bentsen Road. “These guys have been to the mountain, OK, and they’re back,” Cordova said of the men representing all branches of service. Some were drafted in high school and college while others volunteered. After each funeral service, the honor guard returns to the post, putting away their rifles before cracking open a beer — the payment they receive for taking part in a service provided to families free of charge. Cordova also needs the post, which he joined in the 1990s after meeting Homer Gallegos, 71, the post’s commander at McAllen’s Veterans Affairs clinic. He was struggling with post-traumatic stress disorder and Gallegos was a peer counselor. The post is actively working to recruit younger members, not just to join the honor guard but to benefit from the knowledge older veterans have about how to navigate the resources available to them, and to have a place where they can be proud of their service.